We specialize in growing Earliglo and Jewel strawberries. 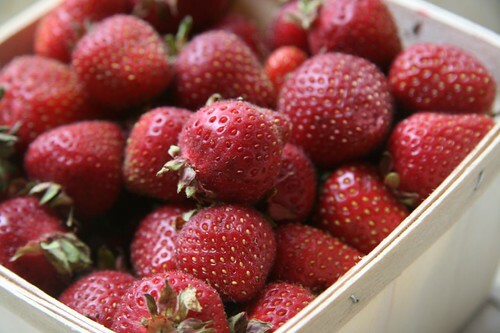 Our strawberries are certified organic, just like the rest of our produce. We have pre-picked strawberries available for pick-up at the farm in Berrien Center, MI, or at the Heartland Cafe in Rogers Park. Pick-up hours: Heartland Cafe open hours are 9am-10pm. Location: The Heartland is located at 7000 N. Glenwood, Chicago, IL. Just go in and ask at the counter. This is our only non-farm outlet for strawberries in 2015. For pick-up at the Farm (8335 Smith Road, Berrien Center, MI 49102), please call our farm manager Gonsalo at (269) 757-1774 to place your order and arrange a pick-up time. On-farm pricing is a bit lower.